Of the many varieties of lock associated with modern living conditions, the mortice bathroom lock is one of the most recognisable. Most mortice bathroom locks are based on the hybrid mortice sashlocks, though some take influence from the more traditional mortice deadlock design. 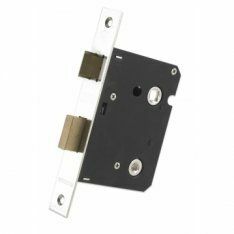 If locks aren’t your style, we also carry an excellent selection of mortice latches to suit your tastes, and all of our locks and latches are available in both brass and stainless steel to correspond to your home environment. For a secure yet minimalist look, see our diverse range of rim locks & night locks. These stylish locks are easy to operate and offer dependable preservation in a compact form. On the other hand, if you require some heavy duty protection and don’t mind a bit of bulk, our budget locks, fire brigade locks and padlocks are an incredibly durable option. These fixtures are designed to take a beating, and their resistance to erosion makes them suitable for outdoor applications. At Ironmongery Experts we pride ourselves on delivering expertly crafted products and fixtures to match your needs, no matter the occasion.